What is a ruptured eardrum? Does a ruptured eardrum cause pain? What are the signs and symptoms of a ruptured eardrum? What causes a ruptured eardrum? How can I tell if I have a ruptured eardrum (diagnosis)? What are the treatments for a ruptured eardrum? How long does it take for a ruptured eardrum to heal? Will I lose my hearing if I rupture an eardrum? Can I go swimming after a ruptured eardrum? How can a ruptured eardrum be prevented? A ruptured or perforated eardrum is a hole or tear in the eardrum (tympanic membrane). A ruptured or perforated eardrum usually causes pain if the cause is infectious (ear infection) or traumatic; however, other causes may not cause pain. Relatively common causes of a ruptured eardrum include infections, car accidents, sports injuries, and putting foreign objects in the ear. A ruptured eardrum is diagnosed routinely by otoscopy (use of an otoscope), however, your doctor or other healthcare provider may order additional tests. Treatment of eardrum rupture varies from person to person. Some individuals require no treatment, while others may need to have surgical repair the eardrum. It takes several weeks (about two months) for a ruptured eardrum to heal. Most people will not lose all of their hearing, however, rarely, hearing loss may occur in the damaged ear. While the ruptured eardrum is healing, you should not go swimming or participate in certain physical activities. Ask your doctor when you can start exercising again. You can prevent a ruptured eardrum by treating middle ear infections, avoiding sharp changes in atmospheric pressures, avoiding putting items in the ear, not attempting to remove earwax with cotton swabs or items like paperclips, and by avoiding noise at high levels. A ruptured eardrum, also known as a perforated tympanic membrane, is a hole or a tear in the eardrum. The eardrum is a thin tissue that separates the ear canal from the middle ear. 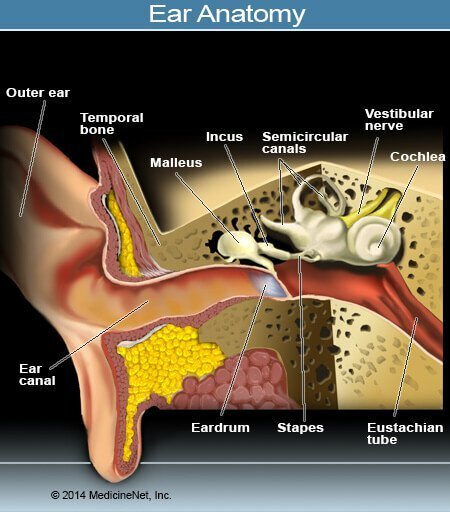 This illustration shows where the eardrum is located along with its adjacent structures (external ear or auricle, ear canal, small bones [malleus, incus, and stapes]), and the Eustachian tube. Moreover, it shows how the ear bones connect the eardrum to other structures such as the semicircular canals, the vestibular nerve, and the cochlea. Note the close relationship of the middle ear to the temporal bone. How does a ruptured eardrum affect hearing? In the picture above, the eardrum is connected to, and moves the bones in the middle ear that send out signals to the nerves and to other structures. A hole in the eardrum does not allow the normal movement of the eardrum as a response to sounds. Usually, the larger the hole in eardrum means that your hearing will worsen. If the rupture is very large, your eardrum may not translate any sound waves to the bones in the middle ear, which results in hearing loss. Perforations or ruptures of the eardrum may or may not cause pain depending upon the underlying cause of the rupture or hole. Moreover, the size of the hole, and where it is located on the eardrum surface may play a role in eardrum pain or its absence. Infections are the primary cause of a ruptured eardrum. Usually, if there is no infection, the condition causes no pain. Complications of a ruptured eardrum include vestibular disorders (labyrinthitis, bacterial labyrinthitis, vestibular neuritis, Meniere’s disease) and mastoiditis. Infection is the most common cause of ruptured eardrum. The infection is caused by viruses, bacteria and/or fungi that infect the inner ear and/or Eustachian tube, which exerts pressure on the eardrum and stretches it. The eardrum then may perforate, depending upon the amount of pressure put on it. Rapid changes in atmospheric pressure, for example, barotrauma from scuba diving or from explosives producing a blast wave. Most ruptured eardrums are diagnosed by routine otoscopy by primary care physicians, emergency medicine physicians, and/or otolaryngologists, or by medical professionals skilled in laryngology with an otoscope. Small ruptures or a small hole may require otomicroscopy to locate them. Screening tests (screening tympanometry) may show evidence of perforation; however, screening tests need to be confirmed by physical examination of the ear. Most doctors will perform audiometry to record the extent of the hearing loss. This test is highly recommended before treatment attempts. The treatments for a perforated eardrum depend upon the symptoms, the size of the rupture, and a risk-benefit analysis done by your doctor and yourself to determine what treatment(s) are best for your condition. Some patients’ perforation of their eardrum have few or no symptoms, and medical treatment is not necessary for these individuals. However, if the individual participates in certain lifestyle activities such as water sports or scuba diving, they should discuss potential treatments and/or risk-benefits of treatments with their doctor. Larger perforations may result in greater hearing loss. Audiology tests can help determine the extent of hearing loss. Larger perforations may be repaired surgically, but again, individuals should receive medical advice from their doctor or other healthcare professional about the risk benefits of surgical repair of the eardrum versus the use of a hearing aid. Over-the-counter (OTC) pain medicine (analgesics) are used for ear pain or earache due to perforation. Meclizine (Antivert) can be used for the dizziness or for associated vertigo. Occasionally, antibiotics for bacterial infection may be used. Eardrops may help relieve ear discomfort. On the average, a ruptured eardrum can heal within about two months. Small ruptures may heal faster. Some very large perforations and occasionally, some smaller ones will not heal. For these problems, an eye, ear, nose and throat doctor (ENT surgeon, otolaryngologist) may use a graft of the patient’s fat, muscle or other material like a paper patch to close the perforation and allow the eardrum to heal (myringoplasty, tympanoplasty). Although a perforated or ruptured eardrum can cause hearing problems, it does not mean that you will lose your hearing. However, until the eardrum heals, you may experience some decline in your ability to hear. With severe ruptures, some individuals may lose their ability to hear and may not be a candidate for eardrum surgery. These individuals may be able to augment hearing with a hearing aid. Most doctors and health care providers who treat individuals with ruptured eardrums advise their patients not to go swimming while the eardrum is healing. The eardrum helps to keep viruses, bacteria, and other contaminants from entering the inner ear. Swimming can cause pressure changes that can force contaminants and bacteria through the ruptured membrane and encourage problems such as infection of the inner ear. This situation is especially true for individuals that like to scuba dive. You and your doctor need to discuss when and if you are able to go back to swimming and other activities like scuba diving. One of the first ways to prevent a ruptured eardrum is to get treatment for middle ear infections as soon as they develop. If you are flying, you should try to keep your ears clear by equalizing pressure using such techniques as yawning, chewing gum or gently attempting to blow your nose while pinching your nostrils and keeping your mouth closed. Keep small items that children may use to put in their ears out of their reach. Moreover, if the child is old enough, you can teach them about the damage that can be done by putting items in their ears. Adults should never attempt to dig out excessive earwax with cotton swabs, paperclips, hairpins and/or other objects that can easily rupture an eardrum. Noise at high levels (industrial machinery, gun shooting) and sharp changes in atmospheric pressure (explosions) should be avoided by using protective earplugs or earmuffs.